Customer Acquisition and Retention Solution (CARS)® A Patented first of its kind comprehensive customer revenue focused application suite built for Automotive Dealerships. Its design is the result of continued input from a consortium of dealers with the sole purpose of acquiring and retaining customers within an area of influence. No Software installation or downloads! The CARS compliment of products are designed to work independently or in concert to give your dealership a significant revenue advantage. 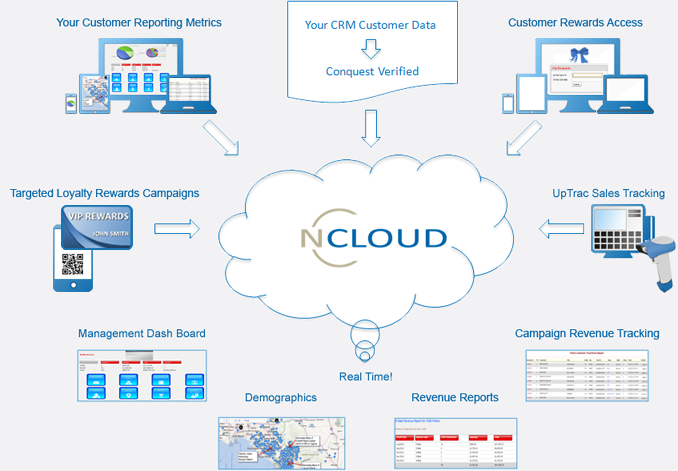 The automotive industries most complete cloud based customer loyalty program. A 360 degree comprehensive approach to analyzing and driving new business to your dealership. Double digit revenue increases are realized using your metrics, not ours. iPhone and Android Mobile and Social media apps for you, your customers and your dealership. Schedule maintenance, request roadside assistance or check your dealership dashboards anytime anywhere using your phone or tablet. Who’sUp? Is a robust round robin sales tool for Automotive and Powersports dealerships that tracks and controls the “Up” rotation of sales persons.